I‘m writing this article with tears in my eyes, and an enormous rip in my heart. I hope that you will take the time to read it all, and embrace what I’m feeling–and what I’m asking of you, as lovers of horses and of horse racing. Please read, and respond in love. Thank you. Horses at Celestial Acres Training Center and the Orr Family Farm died. At least 100 horses, gone. Trapped in their barns and paddocks, no shelter from the beast raging at them–so many equine lives were at the mercy of Nature’s fiercest forces. Horses are intuitive: they knew long before the sirens went off that an agent of Death was on its way, aiming directly at them. They felt it coming. We know that every one of those beautiful animals–more than 100 horses, both Thoroughbreds and Quarter Horses–felt it in their bones. Nothing can take my mind off the fact that they knew. They knew that they were sitting ducks. No amount of alpha mares in the world could protect them from this predator: in a barn or a wide-open paddock, there’s no way or nowhere to run. They knew, and they were terrified. The horses’ spirits all are in Heaven now, racing against Seattle Slew and the Byerly Turk. But that assurance provides no comfort for the owners, trainers, grooms and friends who lost so much. They lost horses, they lost their livelihoods. They lost entire farms. Randall Weidner, who trains Thoroughbreds and Quarter Horses, lost all 12 of his horses. He lost his truck, trailer, tack, computer. 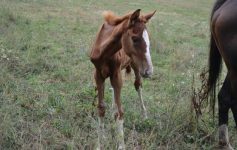 But surely the loss of those horses to both Mr. Weidner and the owners who had entrusted their beloved animals to him–is the most devastating. But a horse needn’t be a Dubai World Cup winner in order to be loved, and valued at the deepest level. 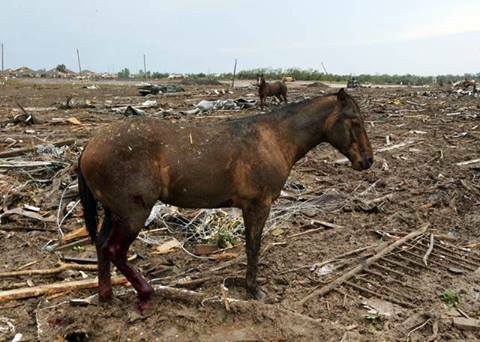 That hurt will last forever, for all whose equine treasures were swept away, or crushed like toys in a matchbox barn. I’m still crying about those horses. I’m sure that you are, too. I’m sure that many of you–most of you–are “liking” things related to the tragedy on Facebook. But “liking” something doesn’t fix it. It may make us feel good, that we “liked” a statement about courage or redemption. But the reality is that “liking” doesn’t do a damned thing for those who lost so much in the span of 40 minutes. “Liking” doesn’t pay the bills. It won’t buy therapy for those who need to work through this. “Liking,” in reality, is useless. 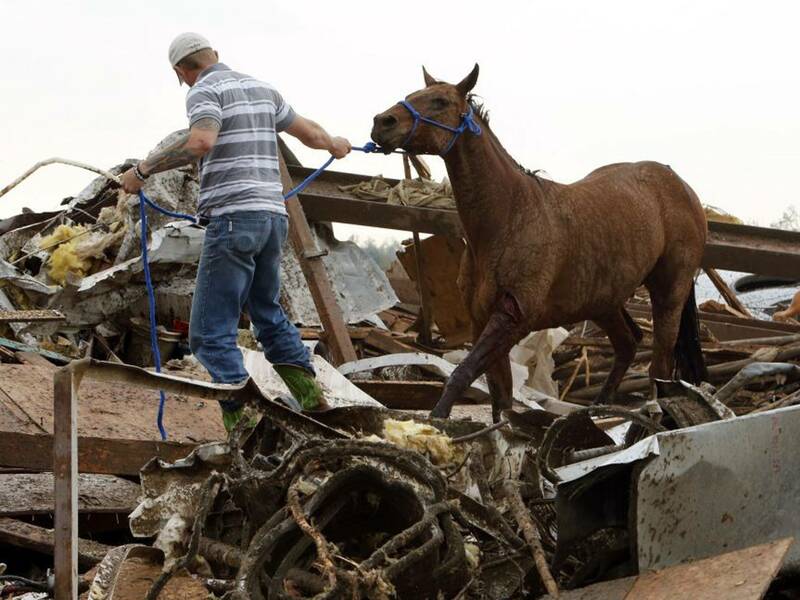 But the enormity of the awfulness is that 100 horses were swept up into the clouds, like so many Pegasi, only to land perhaps 100 miles away, torn and shredded. Horses didn’t just close their eyes and go to eternal sleep: that pretty image may help us sleep at night, but it’s not reality. 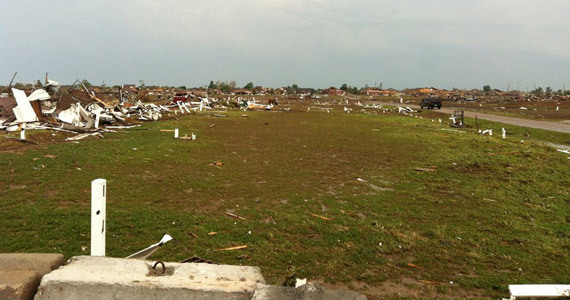 These weren’t little pink ponies in a child’s cartoon show: those who weren’t stolen by the tornado were shredded. Think an ocean of blood. Think of limbs torn out of sockets. Think of profound fear, pain and the stink of Death. Videos of horse slaughter would be matched by photos of horse carcasses in hundreds of pieces, if the media hadn’t been kind enough to spare us those images. Now, think about the people who love those horses–whose hearts and jobs were wrapped around those beings. Think about the trainers and owners, looking for parts of animals they adore. Think of more tears than the human heart can cry, and you’ve almost got the picture. Do you really think that “liking” something absolves us of responsibility? Am I trying to make you feel badly? To make you sad–to feel empathy? Out of even the most horrible of situations, goodness can shine through, or be born anew. 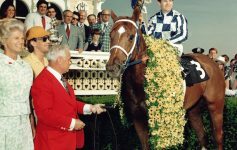 The horse community as a whole–and horse racing as a particular family within that community–has before us a unique opportunity. We have been offered the chance to participate in our own redemption in the face of this unthinkable act of meteorological cruelty. Horse racing has taken a beating in recent years. Once known as America’s Sport, American racing comes up against condemnation and misinterpretation from many corners. Much of it is deserved–much of it isn’t. But many critics won’t give the sport a chance to prove that we have heart–that we do love our horses, and we do want a clean sport. Horse racing is the only sport with which I’m familiar in which the rock stars and the fans have regular interaction with each other. I can’t begin to count off the famous horses, jockeys, trainers and owners I’ve met over the years. I didn’t go to their houses or barns, stalking them like a crazed Aerosmith fan. Any fan who wants to meet her favorite athlete–equine or human–has the ability to encounter them simply by being in the right place at the right time. Whether a backstretch, the Keeneland Kitchen, the frontside of a track or at a betting window–our heroes and heroines are all around us. And the stars are receptive to conversation–I’ve heard very few stories of “so-and-so” being a jerk. Most trainers and other professionals want to encourage rabid fandom. Most of our stars are as accessible as a next-door neighbor. My best friend has been a fan of the Dallas Cowboys for 58 years: he’s in awe of horse racing, because he knows that he has a better chance of being hit by an asteroid, as he does of meeting an actual Dallas Cowboy. Racing is a unique sport–we’re an actual community. We have relationships with each other, on so many levels–both personal and professional. So here we have a community, and a group of our family members are hurting. They’re in more pain than any human should be allowed. If we’re really a community–then we’re all hurting, too. It’s impossible for one member of any family to be in pain without the others being affected by that pain. If your brother is suffering from a catastrophic illness, you know that “liking” his picture on Facebook isn’t going to heal or comfort him. No, if your brother is suffering, you’re suffering, too. So it is–or should be–with horse racing as a family. 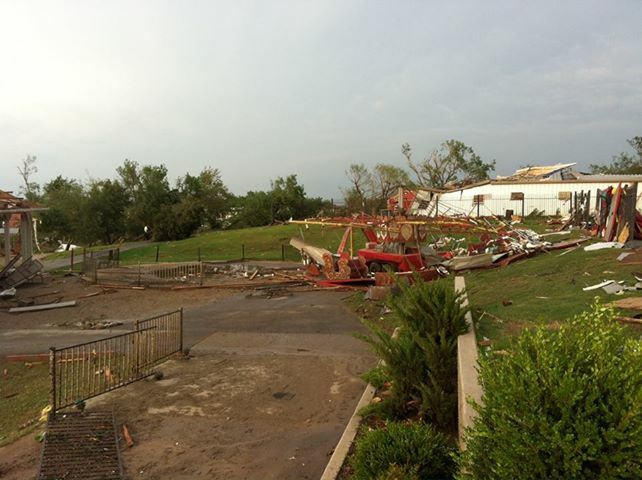 Our brothers and sisters in Oklahoma are hurting, so we are, too. Perhaps you want to get out your checkbook and write a check to Randall Weidner, instead. The mailing address for that gift will be found below, as well. You may be able to give one dollar–-or one single Dinar, Pound Sterling, Euro, Peso, Yen or Dirham. One unit is a wonderful gift, if it’s from your heart. If every horse racing fan just in the United States gave one dollar–that would translate into millions of dollars. If horse racing fans from around the world read this post, share it and send one unit of their currency–the two farms, the trainers, owners and everyone involved will be on very sure footing, for a very long time. As individual fans, we need to give because this is our family that’s in pain. Racing organizations, race tracks, publications, and every other professional company in the sport need to give–or create fund-raising events–because it’s our family in pain, and it’s the right thing to do. No amount of money, in any currency, ever will replace the look of wisdom, love and loyalty in the eyes of any of those beautiful horses who died. No cash on Earth can mend a broken heart. But a massive outpouring of love on the part of the horse racing family–hands and hearts extended to our family members who are grieving, and who are suffering financially–will mean a world of difference to those who are weeping in the Oklahoma horse racing family. And if we don’t respond, what does that say about us–as individuals, as a community, and as a sport? That we can bet two bucks on a horse to show, but not share half that to help another person, or to feed horses who made it through the storm? Our unity as a sport–giving money and goods to our racing siblings who need us right now–will show the world that we’re not in this sport for selfish reasons. We’re all here first because we love horses. And second, we’re here because here is where we are at Home. And Home is the safest place of all, for all. Next Article “You’re So Vain,” Saratoga, Archetypes and the Eternal Spirit of Horse Racing.